Soothing and relaxing color scheme is perfect for the bedroom. Well made, good quality manufacturing and materials. The pillows really put the finishing touches on the set. Lovely, luxurious design and bold, beautiful color make this quilt set something special. Decorate your bedroom in your choice of eye-catching shades in a striped ombre design or flip it over to the reverse print. High quality microfiber is soft to the touch and easy to care for for years of vibrant color. Needed a quilt as our comforter was just too heavy and hot. I wanted a difference color but it was sold out so I opted for another. We received it rather quickly and it is very sturdy and of good quality. None of the stitching has unraveled or come undone. It is perfect for our bedroom as it goes well with our color scheme. Very pleased with this product. I wanted a light weight quilt that can be used all year long and this one works well. It was purchased for a guest room and adds beautiful color to the bed. The 2 added pillows completed the look. Set is beautiful and comfortable however the colors fade and eventually wash out of the quilt. I would recommend if you are careful when washing the item. The colors are so bright & beautiful. The quilt is light weight. Extremely disappointed when I received my quilt, the colors are not like the picture inline and the pillows were not even the same color or style. Huge disappointment! Beautiful quilt! good quality, my daughter is very happy with it. Very elegant quilt, love the color makes a Room look welcoming. Nice quality, returned as the colors didn't appear in person as the picture detailed. My interpretation from the photo was more of a teal green and a deep eggplant, when it arrived they were more of a mint green and brown. Love this comforter! 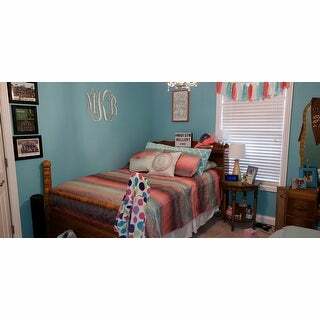 The colors and feel of the comforter are great! I am glad that I did order up a size. As you can see from the pic, this is a full size bed, and I ordered a queen size quilt. I love the color and how well made it is. I only wish it was a little warmer for the winter, but adding a second blanket makes it perfect. "What is the pink? Coral blue or magenta?" "Looking for this in Navy. Do you know when it will be available?" Hello jen04032, items are restocked as they become available; however, we cannot guarantee an item will be restocked. Thank you for shopping with us. Loved the colors and the contemporary look of the set. Hopefully it will match the blue bedskirt I just purchased. I like the fact that it is machine washable and the colors are pretty.